Hyperopia or hypermetropia, is also commonly known as being farsighted or longsighted. This is a refractive eye condition and is a defect in the eye that causes imperfect vision. This is not a disease. Often hyperopia occurs when when the eyeball is too short or the lens cannot become round enough, or the cornea is to flat, causing difficulty focusing on near objects, and in extreme cases causing a sufferer to be unable to focus on objects at any distance. As an object moves toward the eye, the eye must increase its optical power to keep the image in focus on the retina. If the power of the cornea and lens is insufficient the patient will experience undue eyestrain which tend to manifest through fatigue and headaches. In severe cases of hyperopia stemming from birth, the hyperopia is so severe that the two eyes fail to coordinate with one another. The brain is forced to decide how to handle ensuing double vision which contributes to the development of strabismus and amblyopia. In other words the development of amblyopia and strabimus is a neurological reaction to the inability of the brain to put together or merge information from the two eyes. In contrast, the child with myopia can see objects close to the eye in detail and does learn at an early age to see detail in objects. A child with hyperopia will typically stand too close to the television. Normally, we expect that the child would stand far away because the child sees clearer at distance, but because the brain has never learned to see detailed lines and object contours, the child sees blurred objects. Meanwhile, children with myopia learn to see sharp lines because they can see perfectly well very close to their eyes, the brain of a child with hyperopia cannot see sharp lines, so they stand right in front of the television to at least see ENLARGED blurred images. The parents of a child with hyperopia do not always realize that the child has a problem at an early age. A hyperopic child might have problems with catching a ball because of blurred vision and because of a decreased ability to see three-dimensional objects. The child will typically perform below average at school. As soon as a child starts identifying images, a parent might find that the child cannot see small objects or pictures. In many circumstances mild to moderate hyperopia can be mistaken for ADHD; or other learning and personality disorders. One coping mechanism many children subconsciously use is constant head and body movement to attempt to maintain focus. The incidence of hyperopia is correlated with lower IQ, educational attainment, and literacy. This is to be contrasted with myopia, which is associated with higher IQ and educational outcomes. Correcting hyperopia is important especially in young school-aged children. So much of learning about the world is done on a desk, and farsighted individuals who strain to see up close avoid this type of learning because it hurts their eyes and their head. I have seen many cases of a child becoming a great reader and increasing their GPA just from correcting their vision. 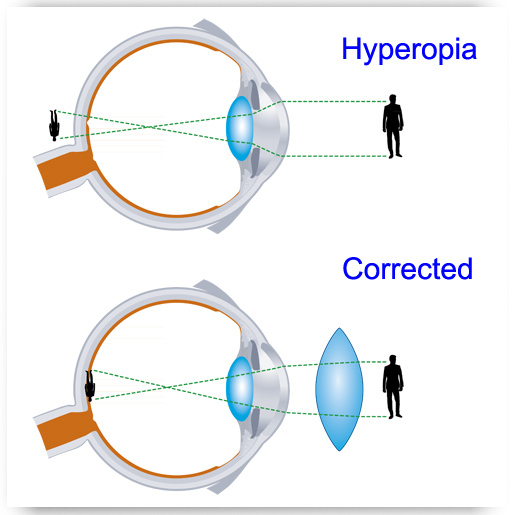 Hyperopia is similar to Presbyopia, in some respects. Presbyopes often report good far vision while experiencing blurry near vision because of a reduced ability to focus on objects up close. Hyperopes often have a very similar type of experience, but the difference is that presbyopia is an age-related change where the eyes natural focusing ability is lost. 1. Glasses – This is the gold standard treatment for all children and is the default treatment for the majority of adults. 2. Contact Lenses – Contacts are a great option. You can also change the color of your eyes. Newer lenses have increased the comfort of contacts for patients in recent years. This very effective form of treatment can be tried during a contact lens examination. 3. Bifocal Glasses – Many people are surprised to see a young person wearing bifocal glasses, but this is a really effective treatment for moderate levels of hyperopia in young patients. The bifocal takes the stress out of focusing up close and strongly enhances a young persons ability to see up close and far away. During the general eye examination, a prescription is always given to the patient, and bifocal glasses are an excellent option for treating a hyperopic patient.